Abraham and Isaac: A dramatic scene where the angel sent by God arrives at the last moment to stop Abraham from sacrificing his son Isaac, c1820, source Genesis, Chapter 22. This was a very popular subject in the Potteries, even through the Victorian period. Height is 8 inches, the colors are superb. $1100. 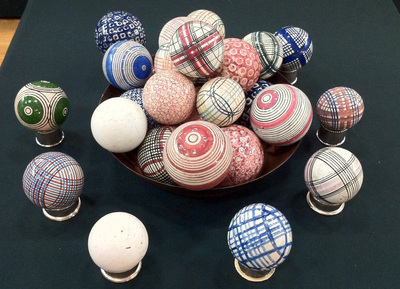 Carpet Balls: Carpet balls are getting popular again, perhaps because they are so colorful and easy to display. These are heavy; it must have been difficult bowling with them down the cold, drafty halls in cold, drafty England. Similar examples in the Sunderland Museum Collection are attributed to the Garrison pottery, second quarter of the 19th century. $100 - 150 each depending on size. 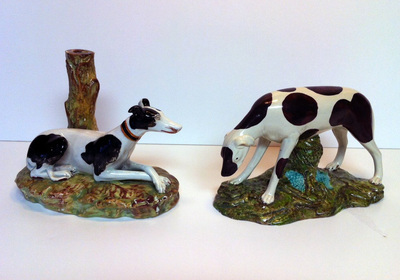 ﻿Pearlware Hounds: ﻿circa 1815. Nice, crisp colors and neat, well modelled figures. $1950 each. The left one probably had a removeable bocage when it was made. These have been lost and/or broken over the years and are extremely difficult to replace. 6+ inches wide. 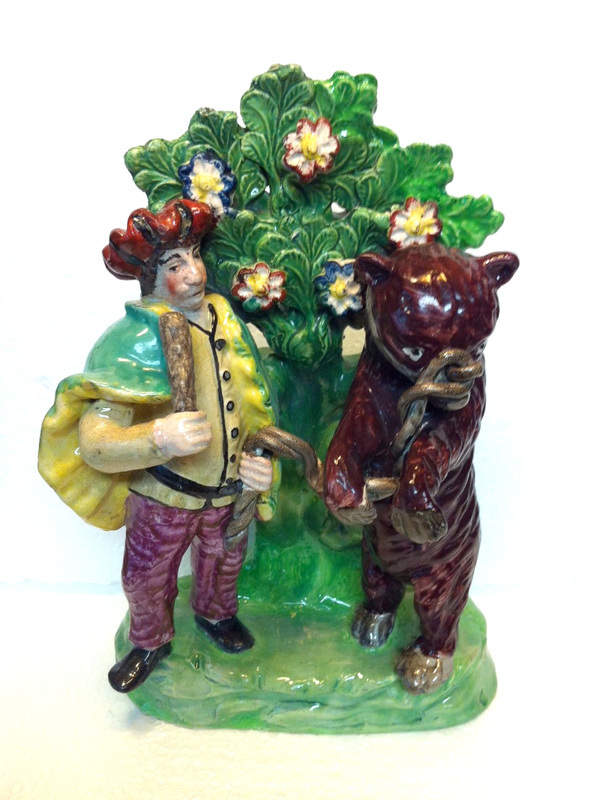 Performing Bear: A figure of a Savoyard with his performing bear was a popular part of the traveling menageries. This one is 8+ inches tall with a lovely bocage, circa 1820. $1450. The Dandies: This figure is perhaps the most popular pearlware figure. It has been used on the jacket of three references and so perfectly personifies the period of the early 1800s. Fashionplates on parade, the gentleman carries a handbag and the dandizette has a parasol. c1820, $1550. There is a cute miniature Dandies for $395. Faith, Hope and Charity: These Enoch Wood figures are sometimes referred to as The Three Graces, Faith, Hope and Love. They are $2800 for the three. I also have a set on black square bases from the Wood and Caldwell pottery for the same price. There is very little restoration, except for the tip of Hope's anchor, but I really don't think I have ever, ever seen an unrestored anchor on a figure of Hope.